Indian firms have fared poorly in a Harvard study that aimed to determine the most and least empathetic companies in the world. According to the authors, Empathetic Companies “retain the best people, create environments where diverse teams thrive, and ultimately reap the greatest financial rewards.” Indian firms occupied the 1st, 2nd, 3rd, 5th, 6th,7th, and 11th in the list of “least empathetic companies”. In comparison, not a single Indian company made it to a corresponding list of “most empathetic companies”, which had Facebook and Google in the top two positions. 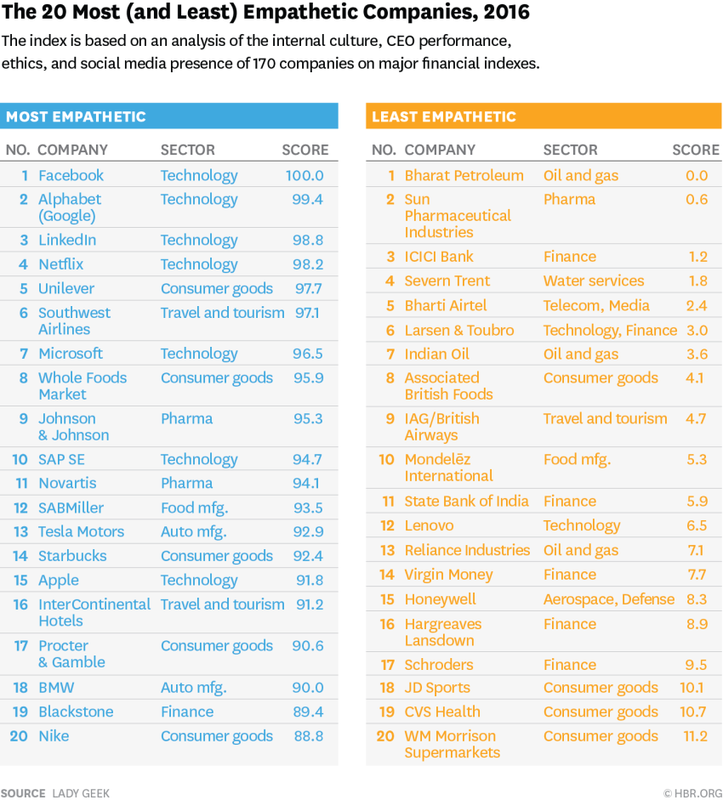 Of the 170 global companies studied, the least empathetic company was Bharat Petroleum, and occupied the top spot in the least empathetic list. Sun Pharma and ICICI Bank were at positions two and three; Airtel was fifth, L&T was sixth, and Indian Oil was seventh. SBI brought up the no. 11 spot. The most empathetic companies in the list were the usual suspects – Facebook, Google, Linkedin and Netflix were the top 4; Microsoft was seventh. The study had broken down empathy into categories: ethics, leadership, company culture, brand perception, and public messaging through social media, and included metrics such as including CEO approval ratings from staff, ratio of women on boards, and number of accounting infractions and scandals. The authors also analyzed 2 million tweets, and included a “morality” score as well. And while empathy isn’t just good for employee morale and brand image – it also seems to affect financial results. The top 10 companies increased in value more than twice as much as the bottom 10, and generated 50% more earnings. The authors also found that empathy was strongly correlated with ethics. This doesn’t come as great news for the Indian corporate sector. While the study primarily focussed on US and UK companies, the results are pretty unequivocal. Only 10 Indians companies were analyzed, and 6 of them were placed in the bottom 10. While Indian companies are making strides abroad, acquiring companies and businesses across the world, they clearly seem to lag in the softer, more human aspects of business.